In a bizarre incident, sperm was an unexpected side dish for a 63-year-old woman in Korea. She was eating partially cooked squid when a sperm bag was injected into her mouth, leaving her tongue essentially inseminated with squid spermatophores. By all accounts, she is not pregnant with baby squid. She did have to make a visit to the hospital though, to check a "foreign-body sensation" and pain in her mouth after spitting out the nasty sperm bag. But I don't suppose the sensation is anything near to the prickind caused by aliens emerging from human host. (Of course that happens only in Hollywood movies). What happen to the Korean woman is true. 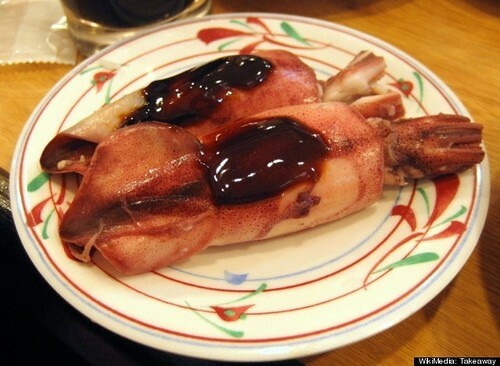 The Huffington Post reported that a woman in Seoul, Korea was eating semi-boiled squid when the cephalopod injected its sperm bag into her tongue, according to research published in February. Doctors found that the squid had left "twelve small, white spindle-shaped, bug-like organisms" in the mucous membranes of her tongue and cheek. Indeed, the woman's mouth had been essentially inseminated. Researchers think that the squid's sperm bags came out while the woman chewed her food. Squids have "sperm bags," which are ejaculatory apparatuses that attach themselves to a female's body before slowly secreting sperm, according to Fairfax New Zealand News. It's not the first time a squid has tried to fertilize a human mouth. There have been several incidents in Japan where people have complained of oral stings by their food, the news site reported. When consuming raw squid, diners should remove their internal organs, or boil the tasty treat long enough to kill its sperm bags, researchers warned. The research was published by the American Society of Parasitologists in the Journal of Parasitology. TheGreenMechanics: That's the reason I don't take raw foods. Not even 'medium'.